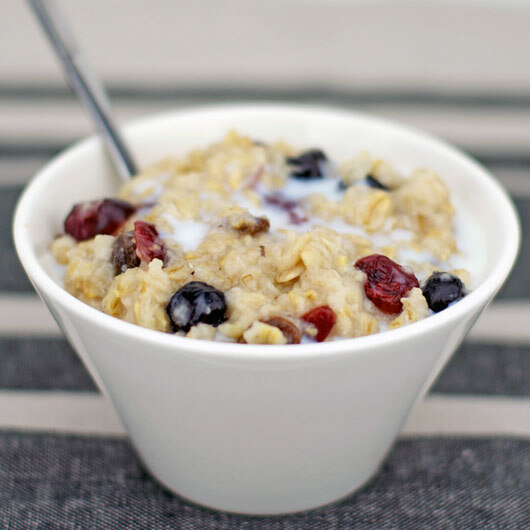 In a microwave safe bowl, mix together the milk, oats and dried fruit. Microwave on high for 1 minute. Stir mixture. Continue to microwave until mixture starts to boil (about 1 more minute). Remove oatmeal from microwave and stir. Cover and let set for 2 minutes. Remove and stir in sugar and spice. Serve warm with additional milk if desired. Note From Mr Breakfast: I just tried this recipe (May 14, 2013) and it worked out perfectly. The only suggestions I have is to maybe reduce the cinnamon to 1/8 teaspoon and finish off the serving with a very light drizzle of maple syrup or honey. Besides that, this is a great recipe. Four minutes to make such a healthy, delicious breakfast is pretty impressive. Thanks to "jeffery" for submitting this one. Super fast. Super healthy. Super cheap. Super tasty. Mr Breakfast would like to thank jeffery for this recipe. Recipe number 1733. Submitted 5/4/2006.